The Colorado Rockies defeated the Astros in come-from-behind fashion thanks in part to a wild sequence in the 7th inning when baserunner Raimel Tapia sprinted home on batter Nolan Arenado's pop foul out to Houston third baseman JD Davis along the warning track outside his team's dugout. Astro teammates hold Tapia up at Coors Field. With Davis all but falling into the dugout if not for the actions of his teammates after the fly ball disappeared into his glove, the question then becomes whether or not the ball should have been declared dead, and a base awarded, based on the rationale that Davis would have fallen into the dugout, if not for the actions of his teammates holding and appearing to even push him back onto the playing field. 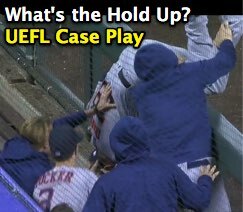 The Play: With one out and the bases loaded, batter Arenado popped out to Davis, who began to fall over the railing into the dugout, but was held up and pushed by his teammates back onto the playing field before he ever had a chance to touch the dugout ground, resulting in an out call from 3B Umpire Vic Carapazza, who kept play alive. During this event, Rockies baserunner Tapia tagged up and hustled home as Davis threw wildly, allowing the trail Rockies runners to each advance a base, effectively allowing each runner to advance one base on the play, same as what would have occurred had the ball been declared dead for a player "falling" into the dugout, stands, or other out of play area. Question: Is this a live ball or a dead ball; should the runners have been given a base automatically pursuant to Rule 5.06(b)(3)(C) Comment or does Rule 5.01(a) Comment apply, even though the fielder may have already caught the ball when he was "held up" and assisted by his teammates? Assume no runners tagged up on the play—would you award R3 home plate (and thus, R2 third base and R1 second base, as well)? Answer: The umpires properly officiated this play. The relevant rule in the Library below is 5.01(a) Comment/Definition of Terms (Catch) Comment, which allows bench personnel to hold or brace a player attempting to catch a live ball with no penalty. U3 Marquez rules 3BC Anderson interfered. Unlike base coach interference, which results in an out (it is interference when, as in Rule 6.01(a)(8), "In the judgment of the umpire, the base coach at third base, or first base, by touching or holding the runner, physically assists him in returning to or leaving third base or first base", or 6.01(a)(9), "the base coach leaves his box and acts in any manner to draw a throw by a fielder," or 6.01(b), "The players, coaches or any member of a team at bat shall vacate any space [including both dugouts or bullpens] needed by a fielder who is attempting to field a batted or thrown ball"), the 5.01(a) Comment pertains to both teams, rather than just the team at bat. 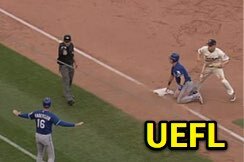 Related Post: Umpire Odds & Ends: Interference Ends Game (Alfonso Marquez/3B Coach) (9/5/10). In other words, a fielder reacts to a live ball and runs towards the dugout without regard to which team the dugout belongs to, and, accordingly—other than the case of the offense's dugout actually interfering with the fielder—the rule does not discriminate between the dugouts of the team at-bat vs the team in the field, and accordingly does not deem players bracing a fielder as illegal assistance in the same way a base coach who holds or pushes a runner is deemed to have illegally assisted the runner in advancing or returning to/remaining on a base. As for the argument that the rule pertains to "attempting a catch" and the fielder has presumably already caught the ball...this isn't true. Had the fielder in this play dropped the ball in the dugout, chances are the play would be ruled a foul ball—no catch. We know per the catch rule that the criteria for deeming a catch legal include, "getting secure possession in his hand or glove of a ball in flight and firmly holding it," "It is not a catch, however, if simultaneously or immediately following his contact with the ball, he collides with a player, or with a wall, or if he falls down, and as a result of such collision or falling, drops the ball," and, perhaps most importantly, "In establishing the validity of the catch, the fielder shall hold the ball long enough to prove that he has complete control of the ball and that his release of the ball is voluntary and intentional." Until the fielder's momentum is arrested and he emerges from his precarious position on the railing, this remains and attempted, but not a completed, catch, which means Rule 5.01(a) applies, even by the strictest of standards pertaining to the phrase, "attempting a catch at the end of the dugout." This is a legal play and, as long as the fielder does not fall onto or stand upon the ground in dead ball territory, the fielder is authorized to complete the play and throw the ball if so desired. OBR Rule 5.01(a) Comment & Definition of Terms (Catch) Comment: "If a fielder, attempting a catch at the edge of the dugout, is 'held up' and kept from an apparent fall by a player or players of either team and the catch is made, it shall be allowed." OBR 5.06(b)(3)(C) Comment: "If a fielder, after having made a legal catch, should step or fall into any out-of-play area, the ball is dead and each runner shall advance one base."